Berkshire Hathaway has often been criticized for holding large amounts of cash but the combination of massive cash holdings and a willingness to act in a major way when opportunities appear has consistently delivered significant value for shareholders over the years. Berkshire has wrapped up a major victory with repayment of the Swiss Re convertible perpetual capital instrument which provided critical funding for Swiss Re in early 2009 at a time when the company was reeling from heavy investment portfolio losses in 2008 and had an urgent need to shore up its capital position. We discussed the terms of initial funding in detail when the arrangement was finalized in March 2009. Warren Buffett was quoted as being “delighted” with the transaction but it is not as if the deal was a slam dunk when it was made. Although the instrument carried an interest rate of 12 percent, Swiss Re had the right to defer interest payments and could opt to pay interest using shares rather than cash. Although the instrument provided Berkshire with conversion rights, the conversion price was above Swiss Re’s stock price at the time of the deal and Swiss Re retained the right to redeem the instrument at a premium to prevent future dilution. In early January 2010, Goldman Sachs predicted that Swiss Re would redeem the instrument as early as June 2010. While this estimate proved to be premature, Swiss Re and Berkshire agreed on terms for the redemption in early November 2010 and final repayment took place in January based on Swiss Re’s 2010 earnings announcement (pdf) released on February 17, 2011. The original term sheet specified that Swiss Re would have to pay a 40 percent premium if redemption took place prior to the second anniversary of the transaction and 20 percent thereafter. 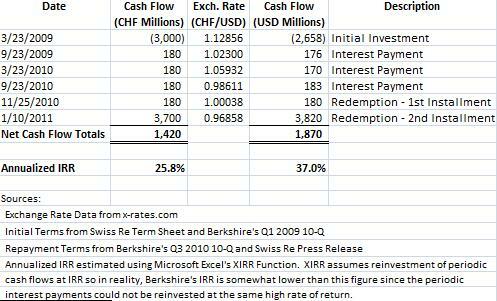 However, Berkshire agreed to accept a 20 percent premium although Swiss Re had to pay interest for Q1 2011 in full. How Good Was This Deal? Although this transaction was far from risk free due to the subordinated status of the instrument compared to Swiss Re’s other debt obligations, the deal has produced excellent results for Berkshire. In exchange for a CHF 3 billion initial outlay, Berkshire received an aggregate total of CHF 4.42 billion in interest payments, redemption premium, and repayment of the original principal. We estimate that the annualized internal rate of return was somewhat under 25.8 percent when expressed in Swiss Francs. However, the Swiss Franc has significantly appreciated over the past two years. Assuming that Berkshire converted interest payments and the redemption proceeds to US Dollars on the date the Swiss Francs were received, we estimate the annualized internal rate of return at somewhat below 37 percent. The exhibit below shows the timing of the cash flows. The flood of cash coming into Berkshire will likely continue this year since Goldman Sachs is widely expected to repay Berkshire’s $5 billion preferred stock investment and will have to pay a 10 percent premium over face value to do so. In the case of Goldman, however, Berkshire will retain the warrants until they expire in 2013. Warren Buffett has indicated that he plans to hold the warrants on Goldman Sachs until expiration which could provide further upside. In early March, The Rational Walk will publish an extensive review of Berkshire Hathaway including an estimate of intrinsic value. Berkshire Hathaway: In Search of the Buffett Premium will also examine the management succession issue at Berkshire. The report will incorporate information contained in Berkshire Hathaway’s upcoming 2010 annual report. Does Google’s “Do No Evil” Pledge Extend to Shareholders?